Picture two computer labs. The first has row after row of cramped desks, each with a desktop computer for students to work at individually, probably to write a paper (but hopefully not the night before it’s due!). 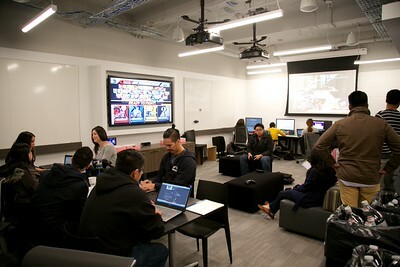 The second lab contains a variety of spaces: open flexible work tables, enclosed team spaces with whiteboards, lounge spaces with comfortable furniture, maker spaces with 3d printers, audio and video recording studios, editing suites, and powerful hardware and software capable of tackling any creative project. Quite a contrast. This comparison is about more than computer labs though. It’s representative of a paradigm shift happening in students’ experiences at colleges and universities. A college experience that was once about working individually to study for an exam or write a paper, is now about working in a team on a range of creative projects that solve a real-world problem in many different forms — yes, with papers, but also videos, apps, models, websites, devices, and performances. To enable these kinds of experiences, institutions have to change their spaces, the services offered in these spaces, and organization and training of the staff who provide those services. brightspot’s work with New York University to create their LaGuardia Co-op provides a useful example of how a university can change its spaces, services, and staffing to support more collaborative, creative experiences for students. We used design thinking to envision and implement more engaging and effective student experiences. Design thinking is a creative problem solving approach that focuses on people, applies social science research tools to understand people’s needs, and then creates prototype solutions to meet those needs which are refined through testing and feedback. To put design thinking to work in envisioning these 21st Century student experiences, we first had to understand who the students were, what their needs were, and how they were changing. So we conducted a needs assessment via an online survey, interviews, focus groups, and observations. We found that students wanted a variety of spaces and technologies, support for teamwork, and a space that was more for focused on productivity rather than drop-in social use between classes — they wanted the space to be theirs and feel like home. We also found they wanted specialized software they couldn’t afford on their own, the chance to learn new skills, and to be able to check out specific devices like laptops and video cameras. To meet these needs, working with architect Gensler, we planned a variety of spaces including open work tables that can be reconfigured, enclosed spaces with whiteboards for teams, lounge spaces, maker spaces with 3d printers, recording studios, editing suites, and spaces with powerful desktops with specialized software. We also changed the services offered in the spaces and their operations. In addition to the tech support students were already accustomed to, we designed a service model including skills workshops, hosting events to showcase people and projects, and checking out devices. Finally, we developed a new training program that changed the way the staff worked together to deliver these services. This included making students the face of help on the frontlines with the support of full-time staff expertise; having student staff roving throughout spaces to proactively offer side-by-side support and advice; and developing the communication, engagement, troubleshooting, and referral skills of staff. The transformation of the spaces, services, and staffing garnered impressive results. The net promoter score (a measure of customer loyalty based on a customer’s likelihood to recommend something to others) went up 253 percent compared to existing lab spaces that fit with the old model of student experience. We achieved 93 percent, 89 percent, and 76 percent student satisfaction with technology, spaces, and staff knowledge, respectively. As a result of the revamped staff training, there was also a 39 percent rise in the confidence of staff to support students. We also achieved the goal of making the lab a place to get stuff done; from mining data we learned that there was a 56 percent decrease in checking email and social media compared to other labs. Colleges and universities can move the needle on their campus and foster the kinds of student experiences that students ask for, that keeps them engaged, and that build the skills employers want. The key to this is using a design thinking process to redesign spaces, services, and staffing together. These three facets are interdependent. Imagine an Apple Store that had inspiring spaces, but no genius bar, not enough staff, or staff that didn’t have a culture of customer service. That wouldn’t be nearly as effective as the 88 percent customer satisfaction they enjoy today. You can do this too by understanding your students’ needs, testing different spaces and services to meet them, and developing and reorganizing staff to deliver these services and operate these spaces. The process is there. The benefits are clear. Now, get to it!